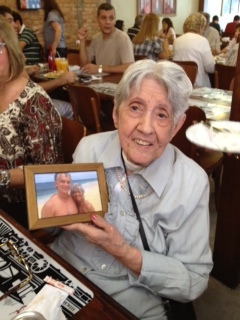 Big lunch celebration in Sao Paulo, a few friends and family members. We are missing all the fun, but they framed Mom’s favorite photo of our recent trip to Hawaii, so in a way, we are there! It’s my FIL’s 89th birthday today. We are having a big family luncheon later today. a little story behind the Filoca: that is not my Mom’s name, but a nickname my Dad gave her probably while they were still dating. No idea where the nickname came from, it has no particular meaning. He was the only one who addressed her as such, but after he passed away, we all started calling her Filoca, and Phil, who prefers to address her in a more formal way, uses “Dona Filoca”. Happy birthday to your mother, Sally. She’s a beautiful lady and doesn’t look her age. I know you miss her. Happy Happy Birthday dear lady! So sorry you can’t be there Sally but she knows your heart is with her today ~ may she have many more that you can celebrate together. Happy Birthday to your mom 🙂 What a beautiful woman! I hope to do the same…. part of it is luck, right? No illnesses, no serious problems, no accidents. But we can do a lot to keep healthy, so gotta keep working on it. A very happy birthday to your Mom, Sally, with wishes for a wonderful year ahead. Thank you so much! I know she is excited about turning 90, and we are all ready for a huge celebration next year! Good health, a continuing enjoyment of life and joy in waking up each morning to welcome a sunny day 🙂 ! Thank you, Liana! She will have fun reading (well, someone will translate for her) all the comments! Happy Birthday to your mother Sally! She looks wonderful and healthy. Oh… I’m sorry I’m arriving late to the party… a very Happy Birthday wish to your lovely Mom! 89 years young… how splendid is that! :).